3D Hair Strokes is typically a procedure done with a manual handtool. This method is ideal for anyone wanting to enhance the look of their eyebrows. The results are natural looking, hair-like strokes, regardless of the amount of hair present. People suffering from alopecia, vitiligo, trichotillomania or any other condition that causes hair loss benefit greatly from 3D Hair Strokes. Additionally, permanent hairstroke brows are great for people with active lifestyles, busy professionals and soccer moms! The pigments used in this procedure have been formulated to match your original eyebrow color, and if the eyebrows are still present, blend perfectly into them. The results are a natural, flawless, fuller looking brow. 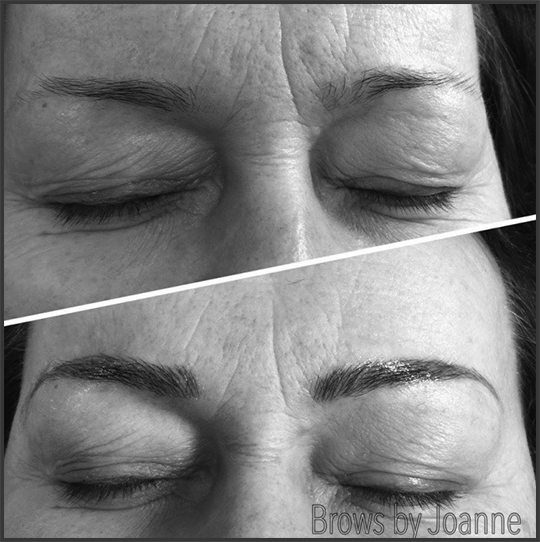 Initially, the brows appear darker, but fade slighly over a two week period. The results can last anywhere up to 1-2 years with the manual handtool depending on different factors affecting the procedure. Touchup would be necessary, over time, in order to retain the shape and saturation of the pigment ink. Ombre Powdered Eyebrows – the results are more powdery and fluffy with a faded front and crisp tail. Ombre brows can last up to 2 years. Suited for all skin types. Best suited for clients with oily skin, thin/mature skin or minimal hair as it creates density and gives the illusion of a fuller brow. Please call for more information regarding Tattoo Removal. ****You will need to send photos at the time of booking. Prices are subject to change. Clients that have Permanent Makeup performed by another technician will be charged full price for the first visit with me regardless of the procedure. Any client that does not show for a scheduled appointment will forfeit their deposit and will be required to pay for any future appointments in full, prior to their scheduled appointments. NO EXCEPTIONS.